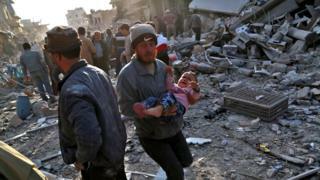 At least 53 people are reported to have been killed in air strikes on a rebel-held town in northern Syria. A market was hit, with video on social media showing widespread destruction. Rubble covers the streets and panicked civilians are seen carrying away the injured. Eyewitnesses say there were three separate strikes. It is not clear whether the strike was carried out by Syrian government warplanes or those of its ally Russia. The town is located in an area of Aleppo province that is part of a “de-escalation zone” established earlier this year by Russia and Iran – which support the Syrian government – and Turkey, which backs the rebels. The zones are credited for creating a drop in violence, but intermittent clashes have continued while humanitarian access is minimal. The area is largely held by opposition forces and a jihadist group formerly affiliated to Al-Qaeda. The UK-based Syrian Observatory for Human Rights, which monitors the country’s civil war through a network of sources on the ground, said children were among those killed. Both the Observatory, and The Syria Civil Defence, whose rescue workers are also known as the White Helmets, gave the death toll as 53. A journalist for the pro-opposition news website Zaman Al Wasl, Ahmed Primo, tweeted that three Russian warplanes had fired missiles at the market. The entire market, which contained more than 100 shops, was destroyed, he said. Photographs published by AFP news agency showed the aftermath of the attack, including the bodies of three young children laid out in a street, partly covered by plastic sheets and a sack. Other images showed rescue workers pulling victims and survivors from the rubble of destroyed buildings. Atareb is home to tens of thousands of Syrians who have been displaced by fighting that is believed to have left at least 400,000 people dead since 2011.